The strong-arm of the BMFL™ family - the superbly powerful BMFL WashBeam comes with extra bright output and an abundance of great features, e.g newly developed framing shutters, super wide front lens and animation wheel. 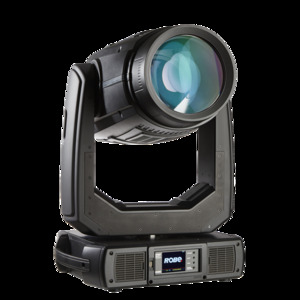 The BMFL WashBeam will enhance any show with its large beam produced through wide 180 mm front lens. With custom light source designed for Robe it produces an astounding 300.000 lux at 5 metres! Rotating gobo wheel with carefully selected gobos ensure many combinations of in air animations, but can also produce nice spot-like projections on surfaces. Four fast shutter blades with smooth and precise movement offer individually angled positions within a frame - which itself can rotate through 90 degrees, providing a sharp or soft, precisely repeatable frame for the projected image. Fast movement of the framing system also allows unique in air beam effects. Adding frost fi lters can enhance the projection by adding smooth touches to the beam‘s edge.